This lavishly illustrated discography is the definitive statement on the legendary progressive music movement in Sweden during its most flourishing and innovative period – from 1967 and all the way through the 1970's. It has even become one of the most important areas among record collectors from all over the world. Meticulously researched, the book guides you through every single artist and group that ever had a progressive record released! On major labels as well as on the small independent labels. They are presented in detail along with all the individual musicians that made it all happen. It covers the fuzz guitar groups, the experimental bands, the power trios, the radical political groups and the psychedelic acts. Early pioneers like International Harvester, Made In Sweden, Hansson & Karlsson and Mecki Mark Men paved the way for renowned acts like November, Träd, Gräs & Stenar, Blå Tåget, Nationalteatern, Hoola Bandoola Band and Kebnekajse as well as the mavericks of Knutna Nävar and Rävjunk. They are all included! As well as the highly collectable acts as Radiomöbel, Taste of Blues, Gandalf and Epizootic. This superbly produced full colour book presents approximately 400 artists and their records in detail with a collector´s valuation guide for the original vinyl records and with all sleeves nicely depicted! Albums, EP:s and singles. Including all international releases from around the globe. Artist- and member-index. An exclusive BONUS CD is included inside the book! 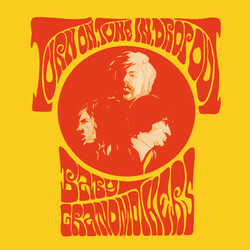 It is a previously unreleased 32 minute recording by The Baby Grandmothers. A master quality recording from 1967 from the legendary Club Filips in Stockholm. It captures guitar maestro Kenny Håkansson's group in three jamming tracks, reflecting the smoky atmosphere in Sweden's first and most legendary psychedelic club!